In 2013, more than 1,250 pedestrians were injured in traffic accidents in Tennessee, not including those pedestrians that may have been injured in parking lots or on private property. This statistic is not unique—since 2004, at least 1,100 pedestrians have been injured in reported crashes in Tennessee each year. These accidents occur across the State and are especially prominent in more populated areas. Tennessee state law imposes certain duties on both drivers and pedestrians which attempt to minimize the risk of automobile-pedestrian accidents. In an effort to protect their citizens, many communities have enacted local ordinances regarding pedestrians that apply in addition to the state laws. Several communities use a similar Code of Ordinances which contain virtually identical responsibilities for pedestrians and drivers using the roadways in their towns and cities. The following local ordinances apply in the cities of Franklin, Gallatin, Lebanon, and Mt. Juliet, Tennessee. Pedestrians and drivers are required to comply with all traffic control signals, markings, and devices. Pedestrians and drivers are required to obey the directions of school safety patrols within school zones. When a vehicle is stopped at a marked crosswalk or an intersection to allow a pedestrian to cross a road, other vehicles cannot pass the stopped vehicle. Drivers must not make any turns until they have determined that they can turn without endangering any pedestrian, and they must use their turning signals to alert other drivers and pedestrians of their intention to turn. Drivers should not pull out of alleys, parking lots, driveways, etc., without ensuring that they will not collide with a pedestrian on the sidewalk or street. At traffic signals, drivers facing a green light must still yield the right-of-way to pedestrians within the intersection or crosswalk. Pedestrians facing a yellow or caution light shall not enter the roadway unless there is a separate “walk” signal. A driver at a red light may make a right turn unless it is prohibited, but the driver must yield the right-of-way to pedestrians. Likewise, drivers turning pursuant to a red light with an accompanying green turn arrow must yield the right-of-way to pedestrians in the crosswalk. 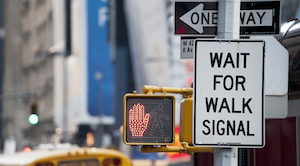 Pedestrians must follow all posted pedestrian control signals, such as “walk” and “don’t walk” signals. All drivers must drive in a careful, prudent manner to keep from endangering any person. Although these local laws exist, many drivers fail to heed them. If you have been injured in a pedestrian accident in Franklin, Gallatin, Lebanon, Mt. Juliet, or anywhere else in Tennessee, you need an experienced lawyer to ensure you get the compensation you deserve. Call us at 615-742-4880 or toll-free at 866.812.8787 for a free, no-obligation consultation regarding your pedestrian injury. Pursuing your legal rights will not cost you anything out of pocket as we handle all pedestrian accident cases on a contingency basis.